This is a sketch of a corner of downtown Rockford, Michigan where I live. The dam and surrounding walk ways are part of Peppler Park. The park is a popular place for families, walkers, cyclists, and eating ice cream. The line of buildings sit next to what was the railroad track through town. The track, now turned White Pine Trail and state park, runs from Grand Rapids, Michigan north through Rockford and points north. The buildings are home to restaurants and, of course, ice cream shops. Wilma and I were on our way to Case Park for the face-to-face sketch crawl but the weather just got too bad as we drove by Bonner Springs. We went to Plan B. Turned around and spent time in Bonner Springs as the rain let up. Followed Kate's advice of "sketch where you are". The weather remained misty most of the time, but not bad enough to keep from seeing the sights. Grabbed our picnic and a sketch at the Visitor's Center, which was a restored caboose. Then we went to the Moon Marble Company. So, did the other sketchers still meet? Kate, here's my contribution to today's virtual sketch crawl. The sketch is of downtown Grand Rapids, Michigan. The river in the foreground is the Grand River, which flows through town and on to Lake Michigan. Today was the warmest we've had all spring. The trees here are just beginning to bud out. 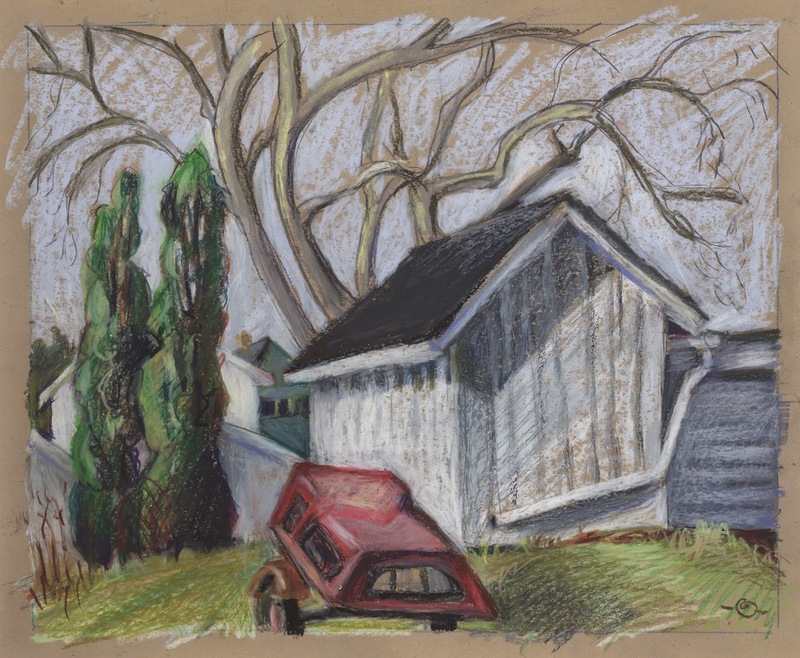 The location for the sketch was a great spot at the river-front park in front of the Gerald R. Ford Presidential Museum. I haven't posted in a while. 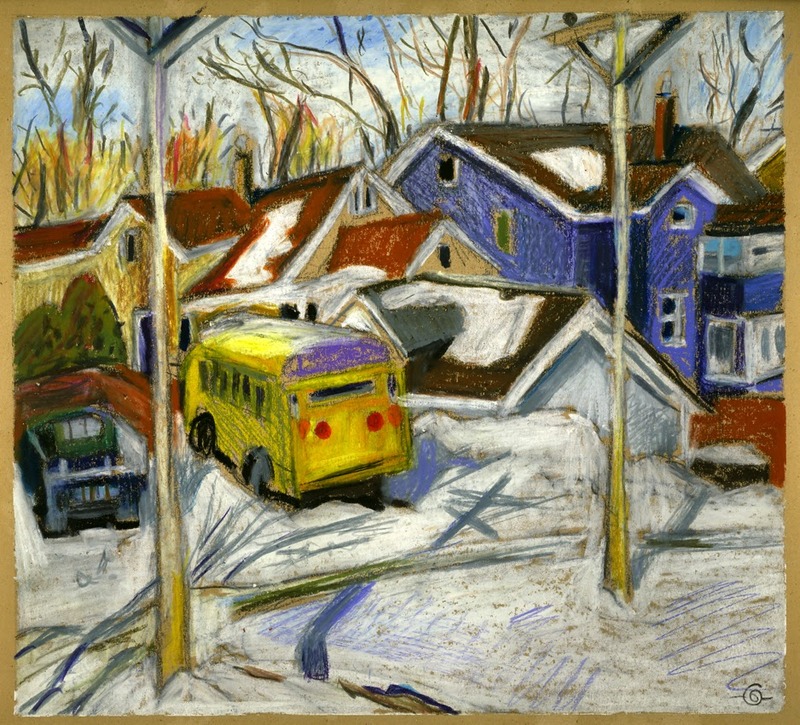 Winter up here doesn't encourage me to get out and do art. So today was a great day to be out. Warm and sunny. Super to be in the park. We're an big regional group, so any time of day you can manage it is fine. Our regular in-real-life KC area sketchcrawl needs to be the NEXT weekend, the 25--sorry! This is me in my backyard. Cedar Falls, Iowa has been home for close to 30 years. My first memory was drawing my parents when I was five years old. I've been trying to figure out the world through drawing it ever since. I became hooked on urban sketching when I went to the 1st Urban Sketcher Symposium in Portland, Oregon, in 2010. I like drawing landscapes. 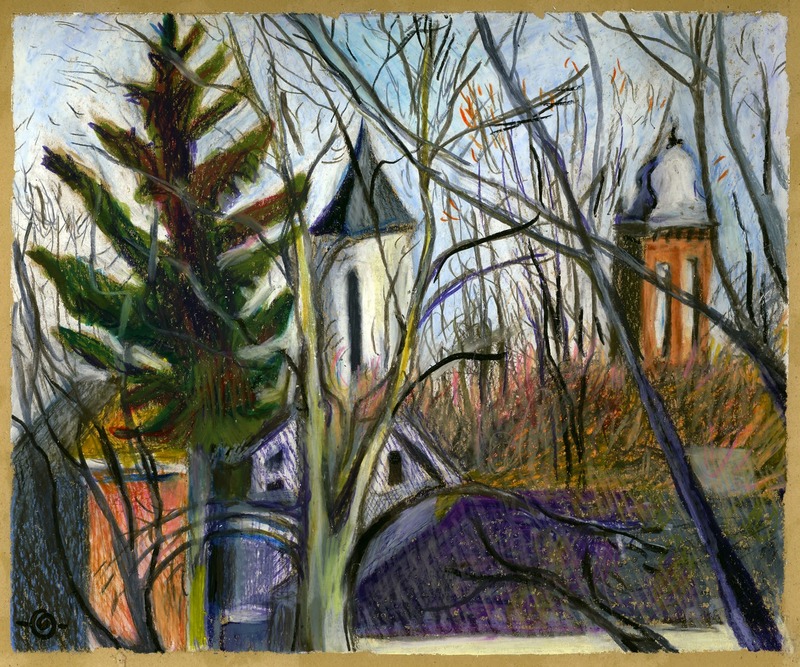 Many of my drawings are of my neighborhood--part of old town Cedar Falls. My favorite media is wax pastels on tinted paper. I spend about 2-1/2 hours on-site, doing one. The 3rd down I did yesterday afternoon. It's finally warm enough to get outside and draw! Since I retired from my wage earning job eight years ago, I draw more than ever. And I travel, drawing wherever I go. I carry a 5B pencil with a stick eraser and a pocket-size Moleskine everywhere. I try my hand at watercolor, too. 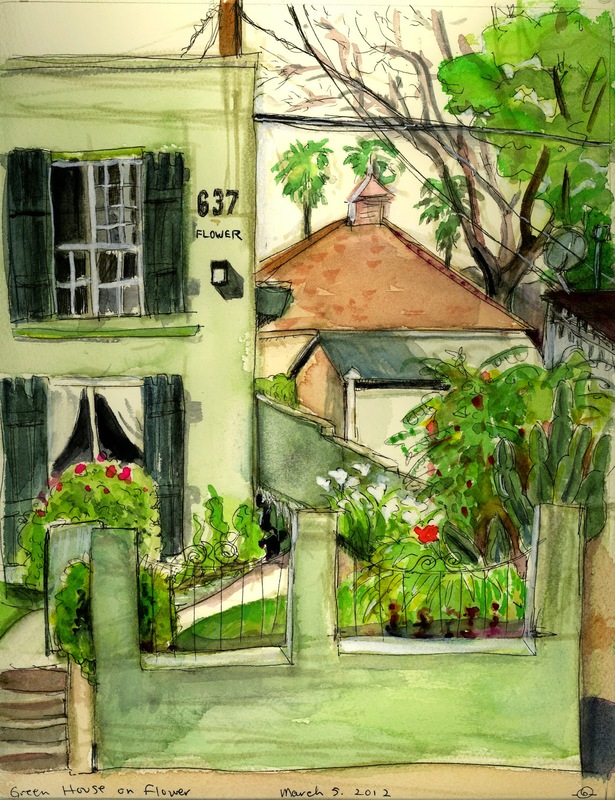 August 2014, I was asked to be a Correspondent on the Urban Sketchers international blog! Very exciting--a dream come true! I also write short personal essays; some have been published and many have been broadcast over Iowa Public Radio when I was a regular commentator in the 1990s. 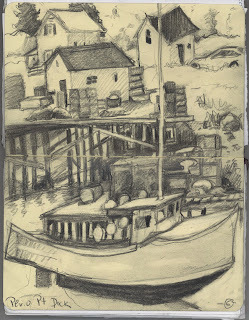 The Urban Sketcher blog is a wonderful format for telling a story with both drawings and words. Here's one of my posts: Bringing the Garden Inside. 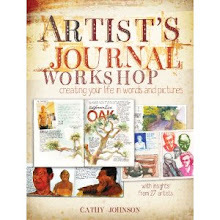 I am also one of the seven volunteer editors for the Urban Sketchers Blog. We curate content for guest posts and interviews. 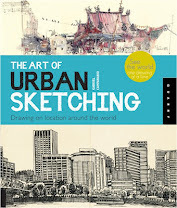 I love doing this and am honored to be the conduit to feature other Urban Sketcher's work. Winter Hats on a Moscow Suburban Train is a guest post by Masha Kirikova. Reuven Dattner's Pattern Rich Israel is an interview. 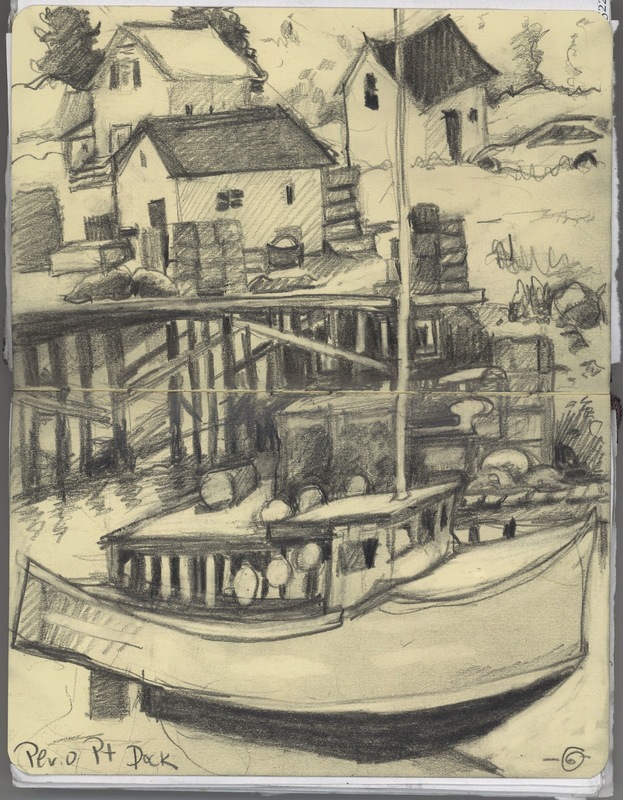 If you have a cluster of urban sketcher drawings and words to go with it that tell a story and would like to be considered for a Guest Post on the Urban Sketcher blog, send your proposal to editorial@urbansketchers.org. Likewise, if you think one of your posts to this Midwest blog should be reposted to the international blog, send us a link to be considered. Soon, all Urban Sketcher regional correspondents will be invited to be listed on the Correspondents page of the international blog. If you're a Midwest Correspondent, get ready by posting your Meet the Correspondent here. 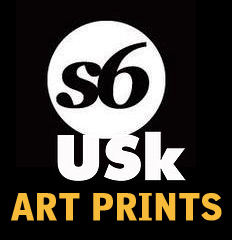 another USk workshop to explore! The waterfall is in the hotel lobby! 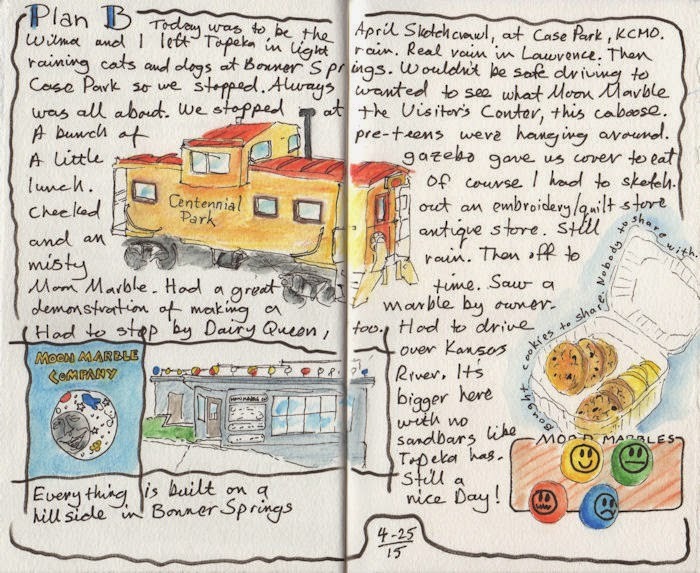 Pictures from our March sketchcrawl at Kansas City's Crown Center--what a zoo!